In 2017 I’m going to learn what works nutrition and food wise to help me train right and recover well. See if it can help me to get back to my racing weight after it’s steadily increased over the last year or so. 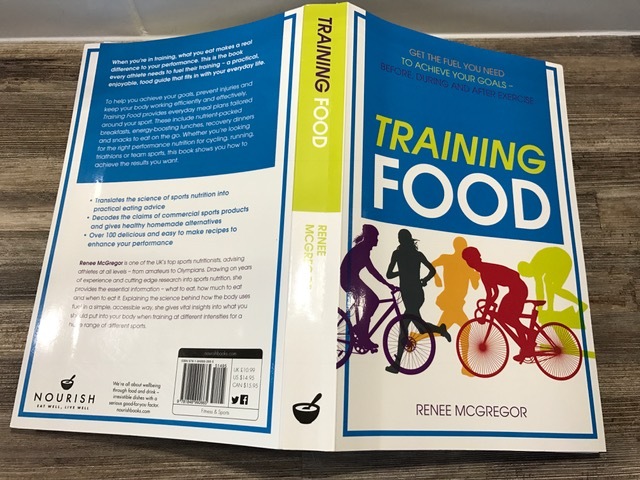 I got this book which I’m half way through – ‘Training Food’ by Renee McGregor. 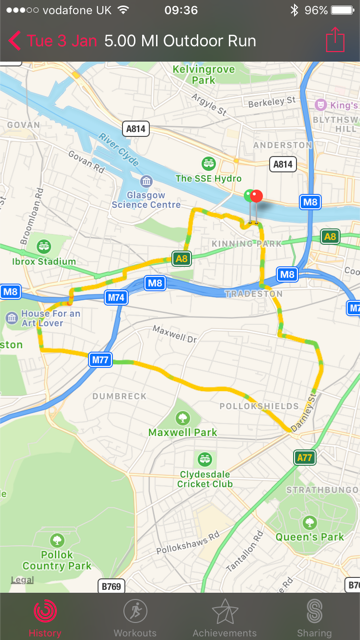 It aims to help you get the fuel you need to achieve your goals – before during and after exercise. I know I could improve what I eat and when I eat, and probably how much I eat too. I tend to eat with a runners mentality, ‘I’ve earned it so I can eat whatever I like’. I’m hoping to change that this year. -1 pink lady Apple, chopped. Put in a pan with 3 tablespoons of water and some cinnamon. Brought to the boil, then simmered. Add the sultanas near the end and simmer together. – In another pan, 1 cup of oats, 1.5 cups of full fat milk, and a sprinkle of salt. 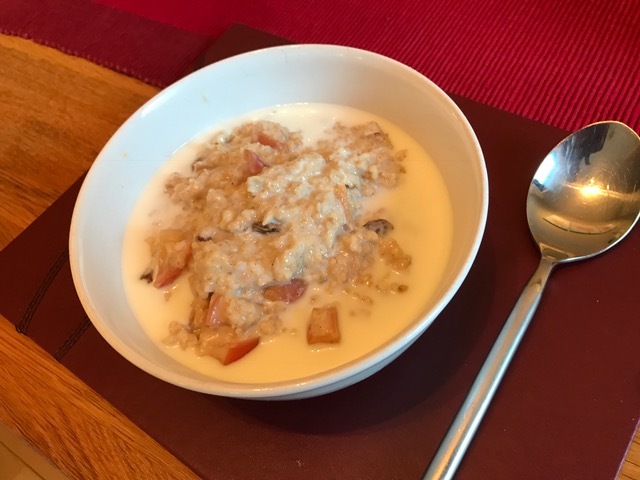 Cook until the milk is soaked up, then add the apple and sultana mix, and serve. The only thing I didn’t like was two pans to wash, but I’ll get over that. 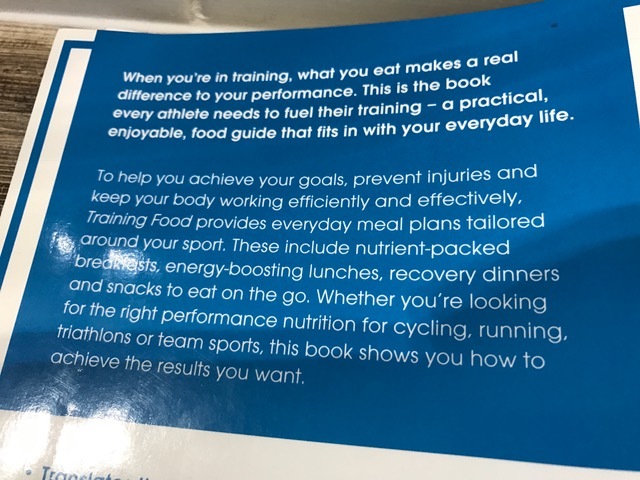 The book has lots of good information in it, from a nutritionist whose worked with Olympic athletes and ‘amateurs’ like me. 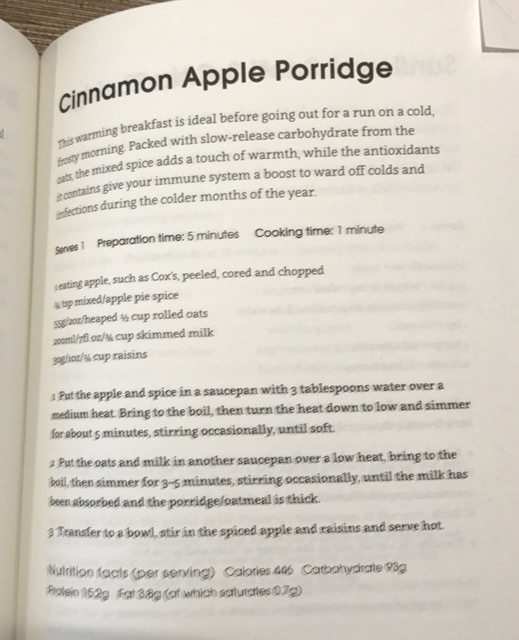 Here the Cinnamon Apple Porridge I made today, although I needed to add more milk to make it wet enough. It was tasty and not too sweet. Very filling! I did a fasted 5 mile steady run this morning, then refilled with this. 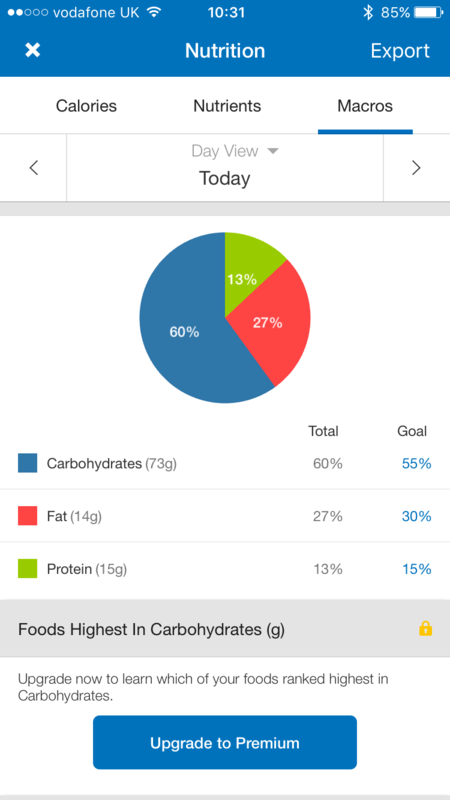 Here’s the stats / macros for it… and my daily split aim is 55% carbs, 30% fat, 15% protein. Time to embrace carbs to fuel me when I need them.